Place the rice in a sieve and rinse it in several changes of warm water. Drain. In a pan heat 3 tbsp of oil and fry the sliced onions until golden brown. Remove the onions from the pan and drain on absorbent paper. In the same oil, sauté the red onion for five minutes. Add the garlic, green chilli, 1 tsp of ginger and 2 tbsp yoghurt. 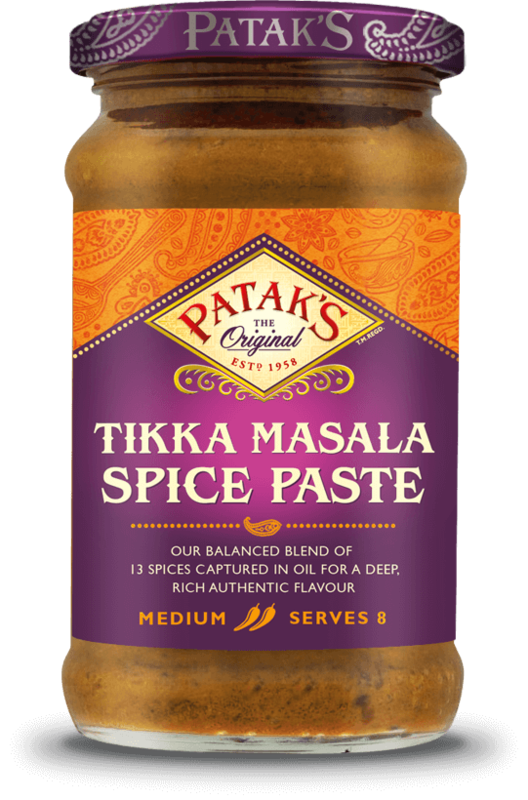 Cook for one minute before adding 3 tbsp of Patak’s Biryani Spice Paste or, if preferred, Tikka Masala Spice Paste. After two minutes stir in the tomatoes and cook for four minutes. Add the yoghurt and cook for a further two minutes. Add the diced carrot, baby corn, asparagus, mushrooms and paneer. If the mixture is too thick add a little water. Simmer for one minute, then remove from the heat. Add one tbsp of coriander and one tbsp of mint. Season to taste and set aside. Meanwhile, cook the rice, place the rice in a large pan with the cinnamon stick, green cardamom, bay leaves, saffron and one tbsp of Patak’s Biryani Spice Paste or Tikka Masala Spice Paste. Cover the rice with boiling water and return to the boil. Simmer for eight minutes or until the rice is just tender but with a little bite. Drain and discard the whole spices. Grease the base of a casserole dish (or an ovenproof dish) with one tbsp of oil and add a layer of the aromatic rice. Sprinkle with some coriander, mint, ginger, cashew nuts and sultanas. Add a layer of the vegetable masala and then sprinkle with some coriander and mint. Repeat the layering until all the rice and vegetable masala has been used. Finish with a sprinkle of coriander, mint, nuts, sultanas and the fried sliced onions. Preheat the oven at 200°C/400°F/Gas Mark 6. In a bowl mix together the wholewheat flour, one tsp of salt and some water to form a dough. Roll into a sausage shape. Press this onto the edge of the casserole dish. Put the lid firmly on top and place on a medium heat on the hob for two minutes (this allows the steam to start building). Then bake in the oven for 20 minutes. Remove from the oven and leave to stand for five minutes, before breaking the seal and serving.